When it comes to the 1-4 offense, there are two variations of the formation. You can have your players line up in the 1-4 high, or the 1-4 low. The 1-4 high is named as such because we put the point guard up top on his own, the shooting guard and small forward at the free throw line extended on the wings, and the power forward and center up at each elbow (the high post area, where the free throw line and lane line connect). The 1-4 low will again have the point guard up top, but we’ll slide the small forward and shooting guard down to the corners, and the center and power forward down onto the blocks (the low post area at the bottom of the lane line). While similar, they do present different advantages. In the 1-4 high we’ve emptied out the back end of the paint freeing us up for all kinds of backdoor and alley oop opportunities. The 1-4 low on the other hand pushes the defense all the way down to the baseline, isolating our point guard up top and giving him a chance to go one on one with his matchup. The beauty of these formations is that they combine the advantages of both the 3-2 formation and the 4-out formation – we get a chance to spread out the defense while still keeping to traditional big men on the court and in a position to be effective. 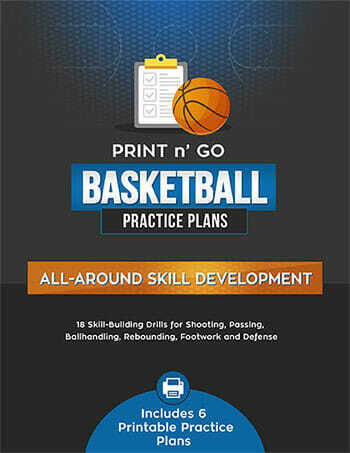 However, the ability to read the defense and make accurate passes from the high post is important to these offenses, and while your bigs won’t need to shoot from behind the arc or dribble very often, those skills would still be valuable.This offensive play runs out of a 1-4 high set, with the point guard up top, the 4 and 5 at the top of the key and the 2 and 3 at the foul line extended. The 1-4 Offenses playbook includes 26 simple, fun and effective plays run from the 1-4 set. From backdoor cuts... to dribble drives... to off-ball screens and on-ball picks... this offense is guaranteed to put your opponent's defense back on their heels, and get tons of easy baskets for your team! 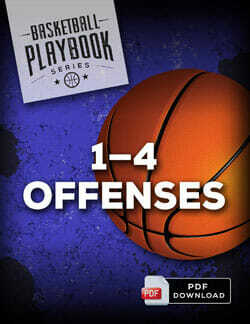 Download the 1-4 Offenses playbook today! Below is a sample play from the 1-4 High. 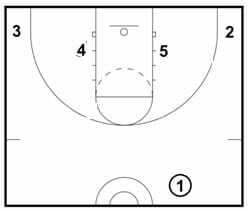 The play starts with the 5 sliding up to set a ball screen for the 1. As this is happening, the 2 and 3 cut down towards the block and stay there for a moment. 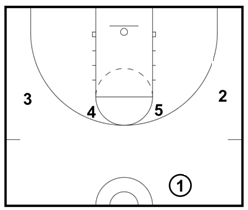 When the 1 reaches the wing, the 2 will slide up the lane and set a back screen for the 5. The 5 comes off the screen and dives hard to the basket, looking for the pass and layup. If that pass isn’t there, the 1 will hit the 2 popping back out to the arc. This will key the 4 to sprint down to the left block, setting a down screen for the 3. – Make sure the cutter brushes hard off the screener’s shoulder without allowing any room for the defender to squeeze through. – If the defender cheats on the 3-man’s curl cut, he can flare out to the three point line, spot up and look for a skip pass from the 2. If you think “4 Up” would work for your team, you’re going to LOVE the complete 1-4 Offenses playbook. 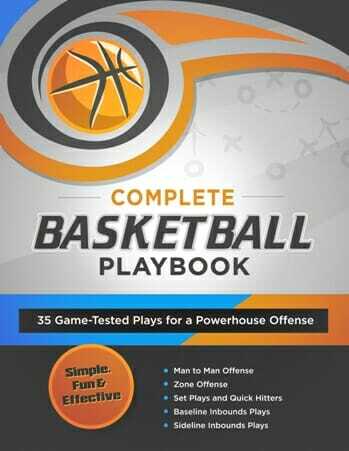 Inside, you get 26 proven plays that work for all ages and ability levels. From backdoor cuts… to dribble drives… to off-ball screens and on-ball picks… this offense is guaranteed to get tons of easy baskets for your team! And it’s all simple to learn. Easy to teach. And devastatingly effective (at all levels of play). We ran our freshmen team offense from the 1-4 sets, totally successful year for the the team. Low Four and great for a real good ball handling swing man. 1-4 is heavily documented. 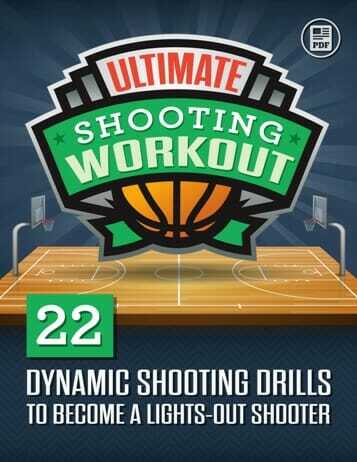 It produced some of the easiest baskets against defenses agressively defending. Pass to the post at the elbow. The strong wing has a v cut up and then backdoor pass from the post to the wing for a lay up and often a foul. Once the defenders pick up on it, then they stay home more, which allow easier pass to the wing for a perfect give and go action back to the point guard driving the lane. The post players screen for the cutting point. I’ve used this for youth for 8 years in various ways. Sometimes a full offense, sometime just a quick hit play based on a match up. Good stuff. I use the 1-4 with my primary and intermediate school teams last two years. It’s simple and gives our players plenty of options. It also forces our kids to look for the options and not rush it. What defense would you run 1-4 high against? interesting answer below. I only ran the 1-4 high against man to man. never against a zone. I run the same play, but I have the 2 screen the 4 and the 3 pop out to the wing for spacing. I love this play and will run it today. Thanks for the plays Coach!! !